Sevens & Stripes Classic Slot Guide & Review - Casino Answers! 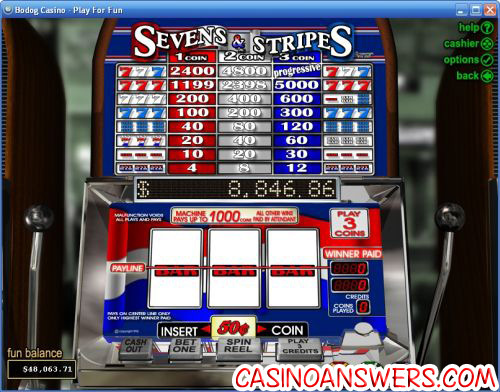 Sevens & Stripes is a 3-reel, 1-line classic slot machine developed by Realtime Gaming, with a progressive jackpot. You can play the Sevens & Stripes slot machine at US-friendly Bovada. To play the Sevens & Stripes slot machine, set the coin value at $0.05, $0.25, $0.50, $1 and $5. Keep in mind the progressive jackpot is different for each coin value and only available on the first three of the five coin values. Once you’ve set a coin size, select one of the chips at the bottom-right. They come in denominations of $5, $25 and $100. You can buy as many as you like (ie. buy $10 worth by clicking the $5 chip twice) and you can cash out at any time by using the red “Cash Out” button. Now you can decide how many coins you wish to play per spin. Use “Bet One” once or twice for one or two coins or the “Play 3 Credits” for the maximum bet of 3-coins. If you use “Bet One,” hit the “Spin Reel” button to play the slot game. Casino Answers strongly recommends you always play the maximum bet to be eligible for the progressive jackpot. 7’s & Stripes has a progressive jackpot that is triggered when you hit a Red Seven, a White Seven and a Blue Seven on a 3-coin maximum bet. Depending on your coin value, the progressive jackpot will change. The Sevens and Stripes progressive jackpot totals for each coin value are: $1,066.61, $5.066.57 and $8,845.60. On the $1 and $5 coin values, Sevens & Stripes has a top fixed jackpot of 10,000 coins. To play for the Sevens and Stripes progressive jackpot, sign up now at Slotastic Casino! Payouts on the Sevens and Stripes classic slot machine are (1/2/3 coin payouts in parenthesis): any 3 Bar symbols (4/8/12), 3 Red Bar symbols (10/20/30), 3 White Bar symbols or any 3 Seven symbols (20/40/60), 3 Blue Bar symbols (40/80/120), 3 Blue Seven symbols (100/200/300), 3 White Seven symbols or Red/White/Blue Bar symbols (200/400/600), 3 Red Seven symbols (1199/2398/5000), Red/White/Blue Seven symbols (2400/4800/10,000 or jackpot). There are 10 winning combinations on the Sevens & Stripes slot machine. To play the Sevens and Stripes slot machine, head over to Slotastic Casino for an excellent $300 signup bonus! Is the 7s & Stripes slot playable for USA slots players? We would hope so, or we’re not exactly sure who this slot machine is targetted towards! Players based in the United States can play Sevens and Stripes at both Slotastic Casino and Bovada Casino. For a list of all of the online casinos that offer the Sevens and Stripes casino game, please read our list of RTG casinos. If I am a Mac user, can I still play Sevens and Stripes? Yes, both Slotastic Casino and Bovada Casino have instant play flash casinos for Macintosh users or Windows users who prefer not to download the harmless casino software. If you experience any issues playing this slot game, you should try installing the latest version of Adobe Flash Player. How do win the progressive jackpot on Sevens and Stripes? To win the Sevens and Stripes progressive jackpot, you must hit the Red 7 symbol on reel 1, White 7 on reel 2 and Blue symbol on reel 3. You must make the 3-coin maximum bet to be eligible for the progressive jackpot. What is the best classic slot machine? What is that lucky sevens slot machine? 7s & Stripes?